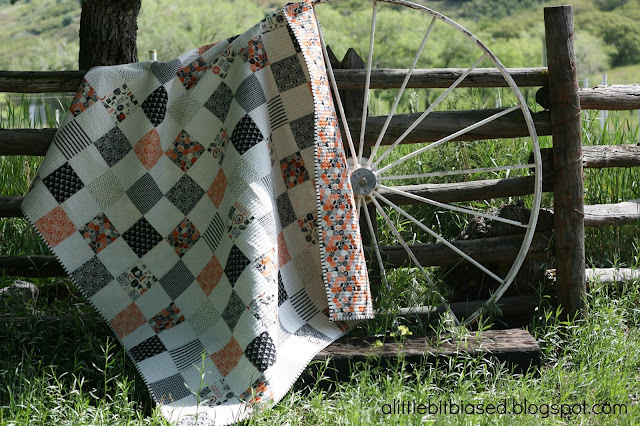 I don't know if I've ever made a quilt as simple as this! it ends up making a great throw size quilt! I thought I'd share the details! Finished quilt size: 58.5" x 67.5"
- cut 13 light 5" x WOF strips, subcut into 97 light 5" squares. then subcut into 98 dark 5" squares. Lay out the squares according to the diagram below, alternating between dark and light squares. It should be 13 x 15 squares. Sew the blocks in one row together using a quarter inch seam allowance. Press the seam allowances in one direction. Continue sewing each row of blocks together, pressing the seam allowances of each row in opposite directions and then finally, sew all the rows together and press. 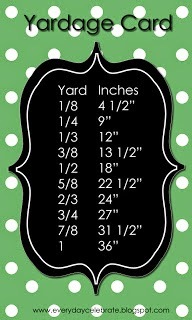 Helpful tip: try using numbered pins to help keep your rows in order! 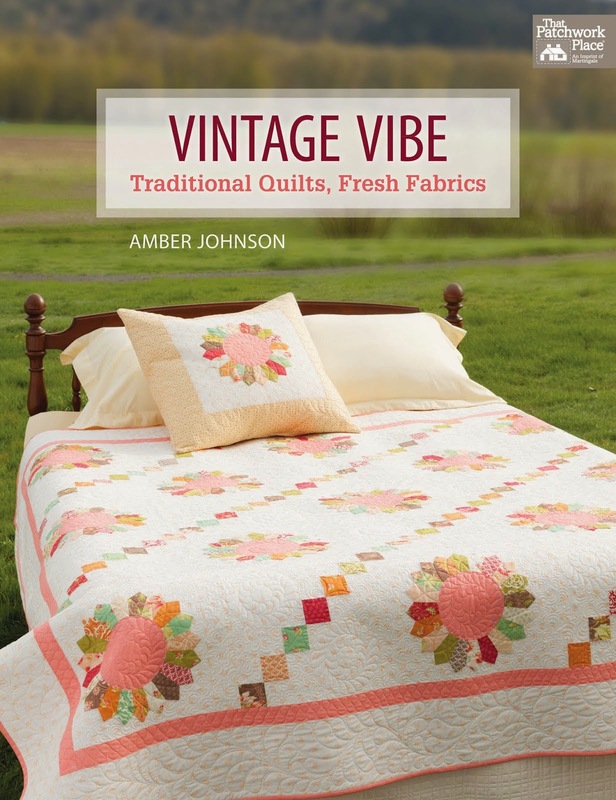 I found mine at a cute little quilt shop in Preston, Idaho called Suppose Create Delight. They saved me time and sanity! Trim the selvages from the backing fabric and cut it into two pieces that measure approximately 42” x 76 1/2” each. With right sides together, sew the pieces together along the long edges to make the backing. It seems so simple but I decided to have my long-arm quilter, Cathy Barney, do straight line quilting on this. I sometimes do straight line quilting myself but this quilt was a little bigger than I was comfortable with (and had time for) so I had her do it. I LOVE it! 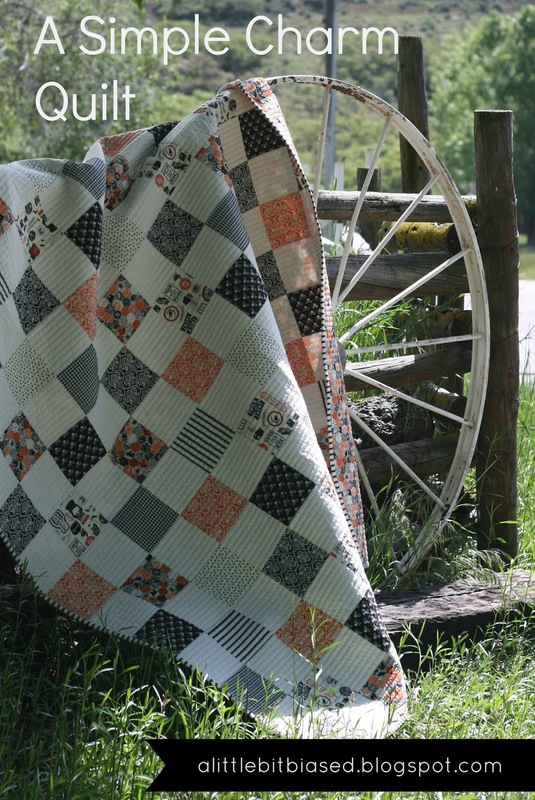 I honestly have never seen straight line quilting that I haven't liked. It's always stunning and never takes away from a design! Even though my quilt is so simple and the quilting is so simple I am really happy with how the whole thing turned out. After it's quilted, bind your quilt with seven 2 1/2" x WOF strips. And you're done! Time to cuddle up with it and enjoy! Most of the fabrics I used were from the line Happy Haunting by Deena Rutter for Riley Blake Designs. I just fell in love with that line when it arrived in at the fabric store I work at a few weeks ago. I also threw in the black check from the line Feed Company by Sweetwater for Moda - just to mix things up a little. I also used a cream shirting fabric (1158 26) from the line Miniature Gatherings for Moda for my light fabric - just to give it an extra vintagy feel! 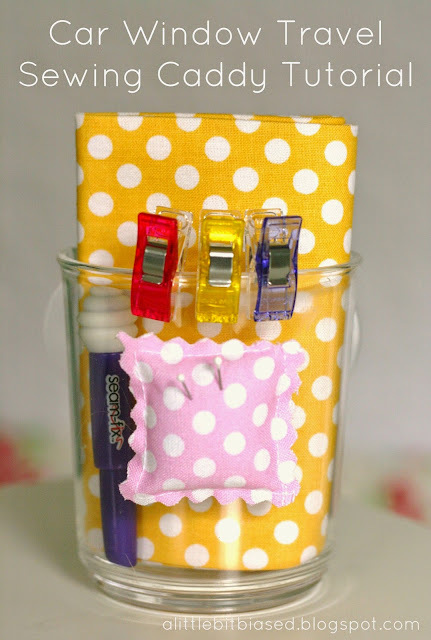 Car Window Travel Sewing Caddy Winners! I hope you all had a wonderful Memorial Weekend. We went on our annual hunt for the perfect flower basket to give my husbands grandmother and visited his grandfather's grave. I'm truly thankful to all those who serve (and have served) our country! I also want to thank all of you who participated in the Car Window Travel Sewing Caddy giveaway. The two winners for the caddy's featured above are... betz2lu and QuiltShopGal. I sent you both an email! Thanks to everyone for entering our little giveaway and thanks to my super talented and creative friend Aniva for sponsoring it! Her fabulous tutorial can be found HERE! 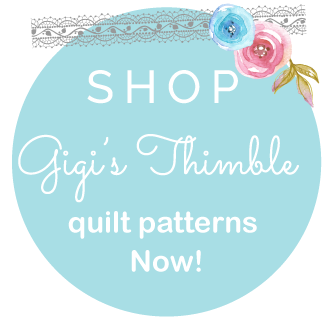 I hope you were inspired to make one of these for yourself or as a quick gift for a quilty friend! Car Window Travel Sewing Caddy Tutorial + Giveaway!!! Today I've invited my friend Aniva to share a tutorial with you for this super cute, super handy car window sewing caddy! She gave one to me as a gift the other day and I loved it so much that I immediately thought I needed to pass along the idea to all of you! This caddy is perfect for all of us that find ourselves doing hand work as we ride "shotgun" in our cars because it suctions right to your car window and it's just the right size to hold sewing necessities but doesn't take up too much space. So without further ado, here's Aniva! Thanks Amber for helping me to create the tutorial for this little caddy. I have enjoyed making these caddies as little gifts for my quilt friends, whether for a birthday or just a little "thinking of you" gift. Sometime back I saw a post online where the blogger had used a shower caddy (the kind with suction cups to stick to the wall) found in a second hand store to create a caddy to use on her car window for when she sewed on car trips--I thought it was genius. I tried for some time to find such a container at a thrift shop and never succeeded. I did, eventually, find a new container that I really like at my local Wal-Mart in the bath and shower section. I found it to be the perfect size for a spool of thread and small scissors. The suction cups adhere it securely and temporarily to the car window without leaving any marks and I can move it about as often as I need to. The only thing I added to the container was a landing place for a few needles and pins. Place your fabric squares WRONG SIDES TOGETHER. Sew three sides using a 1/4" seam allowance--yes you can backstitch. Stuff with a tiny bit of stuffing. Sew the last side together -- be sure to backstitch on this last side to make the whole thing stay together better. Use the pinking blade on your rotary cutter or pinking shears to give the raw seam a cute little zigzag finished edge. Adhere the small pin cushion to your container with a dab of hot glue. Have fun filling your gift caddy with a fat quarter of fabric, small scissors, a package of your favorite needles, a gift card or anything you want. The other thing that I have really loved is making the cute little hexie gift tags. Just type up whatever fun sewing saying you want to have on your tag into your computer using the word processing software of your choice. I set my page to have three columns so that I can get more sayings on one page of cardstock. Remember the tag is not very big so keep your saying fairly short. You can play with different font styles and font sizes. When you are happy with your page print it out on the color of cardstock paper of your choice. Use some paper scissors to roughly cut the words apart. This doesn't have to be precise it is just so you can get your punch around the words. I used the Extra Large hexagon punch by Fiskars (this will give you a hexagon with a 1" side as shown) available at craft stores and websites. With the punch framing your saying, punch the paper. You can distress or embellish your little tag anyway you want. Punch a small circle in one corner so you can tie it on your gift. FYI- the Fiskars medium punch = 1/2" hexie and the Fiskars large punch = 3/4" hexie. If you want to buy some similar hexagon papers, I found these darling little paper hexagon Charms made by Laundry Basket Quilts at a local quilt shop, Just Sew in Highland, Utah. They have the cutest sayings on them. There are 100 in a package and they come in two sizes. A 1" per side size and and 3/4" per side size. The papers pictured above are the 1" size. The sayings are about family, sewing, fabric and friendship. All you have to do is punch a small hole to make them so you can tie them on gifts. Super easy. If you want to purchase some of these online click HERE. Amber is giving away a couple of these little caddies to two lucky readers. To enter, just leave a comment below. We'll pick a winner in the next couple of days. I want to give a shout out to friends at Riley Blake for the cute polka dot fat quarters...thanks for making so many fabrics we love. PS. 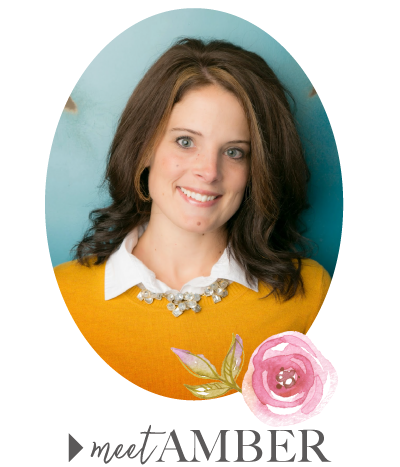 I tried to find the original blog post that planted the seed for this idea in my mind but I was not able to find it so if you are that blogger contact Amber - she will be happy to give you credit on this post. Thanks Aniva for sharing this darling and practical idea with us! I know I'm going to be making quite a few of these for gifts! And thank you for contributing TWO of these cute caddies for our giveaway! Friends, be sure to leave a comment below to enter to win!